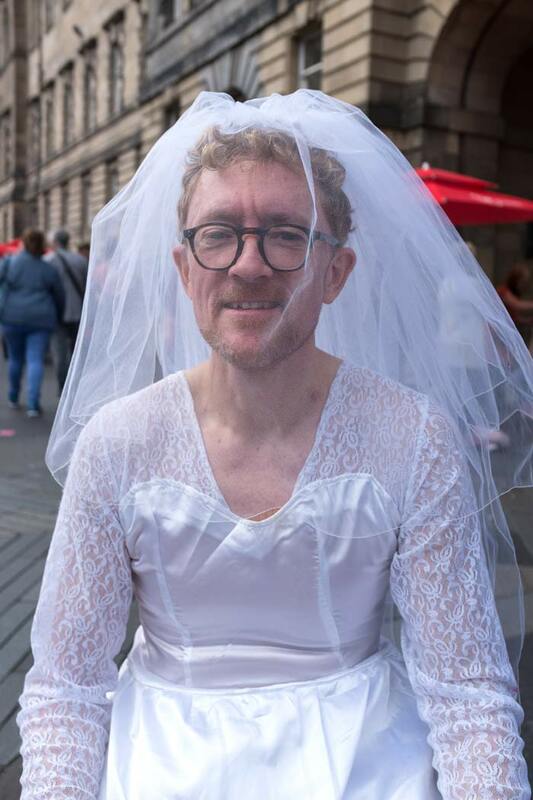 He was on the Royal Mile in Edinburgh during the Festival Fringe, advertising This Much, or an act of violence towards the institution of marriage – a play by the Moving Dust company about relationships and how we express our true selves. Gar can’t decide between the man who plays games and the man on one knee with a ring. In fact, Gar can’t decide on anything because every choice seems like a compromise. Everyone wants answers but nothing lives up to the image he has in his head. Facades start crumbling into a violent mess as the world implodes around him but Gar… Gar just wants to dance with his friends. It got me thinking about the debate about knowing what we want, what we want to want, what others want from us, and what others want us to want. Coincidentally I am reading Freud’s Civilisations and Its Discontents. I am early on in the book and it gets me thinking at every paragraph. What I read is that Freud derides the religious fervour that springs from an ‘oceanic feeling’ of connectedness. He sees religion as a way to keep loneliness, death, and the void at bay. Rather nicely, he reserves his most damning criticism for the vague, impersonal, abstract God. At least the immanent, involved father figure is nearer the real motive for religion, he argues. Recently I read an article by David Bradley on ScienceBase on emotional responses to music. The argument goes that music evokes feelings that are not real in the way that feelings arising out of relationships are real. Freud would go further and say that true feelings arise out of need – one of those needs being to attempt to deny death, insignificance, and the void. It got me thinking about Freud and his feelings/attitude to music – about which I knew nothing. Does that mean he didn’t get off on music? It seems like maybe that is what he is saying. I had a friend who used to put together albums on tape. He would pick and choose from different artists and make a kind of emotional rollercoaster out of the mix. Mix DJs do that but usually in a dance setting, so there is less room for taking the listener here, there, and everywhere. When I am moved by music, I know I am being played and yet at one and the same time I can feel that something in me has been tapped into that is more than just a massage for the soul. It’s a perennial question. Very interesting. If any artform sets me off, emotionally, it’s music. Yes, I’ve thought about this. The first time I heard an early Pink Floyd that used the stereo effect, I sensed an internal universe that I hadn’t identified as a place very consciously previously. Now when I hear about people being cruel or unfeeling – maybe towards animals – I imagine they must have small interior universes. When reflecting on how music affects me, it seems to explore, and to rub along inside some contours of my interior universe (for want of a word to describe it), while paintings get my whole actual body zinging. It may be something simple such as the fact that I am probably standing up when I look at a painting, but I think these different art forms touch different parts – I mean actual different parts of the physical and not physical me. I think the painting part comes because I read it differently to music. I just activated Independent Publisher after seeing your blog! ‘Inner universe’ … that was good! I used to just say ‘strike a chord’ in lack of a better expression. With music, it happens often … with paintings; can’t think of _one_ time. 1983 I saw the movie The Wall, which made me feel … I don’t know … ill at ease, somehow. We’ve just had one of the worst ever case of cruelty to animals here in this city, so it’s kind of on top of my mind. What it does to me, is bring out feelings I wasn’t even aware I was capable of. My inner universe is big, methinks. It’s very kind of you to say so. There is so much to say on the subject. Freud seems to have been distrustful of anything that he couldn’t see as emanating from need – which is why, if I understand him correctly – he was suspicious of music – which seemed to him to be a froth or frippery – a diversion – a means of diverting oneself from the truth, namely that we fear disintegration and death and have a hard time living with that fact. My ‘enlightenment’ on the subject of reason came from reading Robert Persig’s ‘Zen And The Art Of Motorcycle Maintenance’. His phrase ‘the church of reason’ is very powerful, when ‘reason’ is as exclusive as any other dogma. As Shakespeare put it – “There are more things in heaven and Earth, Horatio, than are dreamed of in your philosophy.” – so who is to have the last word on anything? Personally, I feel as though I live most of my life in a dream – with my own questions about what I want, etc. just half-formed and going around in circles.